The failed anterior cruciate ligament reconstruction is a particularly challenging topic for the sports medicine surgeon. Aside from the potentially complex technical facets of these cases, decision-making can be a difficult process with many variables for the surgeon to consider. Additionally, with results inferior to that of primary reconstruction, these are troublesome procedures for patients as well. Adding to the challenge of these cases is their intimate association with collateral or posteromedial/posterolateral corner insufficiency. 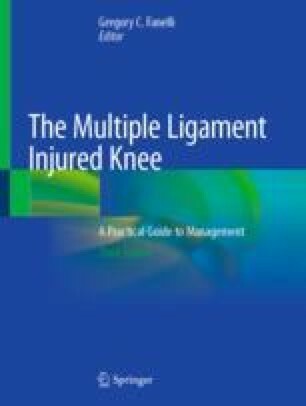 Proper recognition and treatment of these complex injury patterns is of the utmost importance in optimizing the outcome for the patient with the failed anterior cruciate ligament reconstruction. This chapter will discuss the many issues with revision ACL reconstruction and offer tips to address revisions with collateral ligament and posteromedial/posterolateral corner involvement. Mohtadi NG, Chan DS, Dainty KN, Whelan DB. Patellar tendon versus hamstring tendon autograft for anterior cruciate ligament rupture in adults. Cochrane Database Syst Rev. 2011;(9):CD005960. https://doi.org/10.1002/14651858.cd005960.pub2. Debieux P, Franciozi CES, Lenza M, et al. Bioabsorbable versus metallic interference screws for graft fixation in anterior cruciate ligament reconstruction. Cochrane Database Syst Rev. 2016;7:CD009772. https://doi.org/10.1002/14651858.cd009772.pub2. Tiamklang T, Sumanont S, Foocharoen T, Laopaiboon M. Double-bundle versus single-bundle reconstruction for anterior cruciate ligament rupture in adults. Cochrane Database Syst Rev. 2012;11:CD008413. https://doi.org/10.1002/14651858.cd008413.pub2. Magnussen RA, Borchers JR, Pedroza AD, et al. Risk factors and predictors of significant chondral surface change from primary to revision anterior cruciate ligament reconstruction: a MOON and MARS cohort study. Am J Sports Med. 2017;036354651774148. https://doi.org/10.1177/0363546517741484.